If anyone believes the stereotype of lazy villagers, they could not be more wrong. 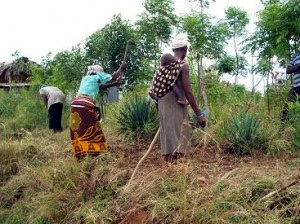 The villagers are very poor but not only do the women and men of the village work all hours to support their families, but almost without exception they have hobbies and transferable skills which are not yet appreciated elsewhere. Typical of their efforts have been helping to dig the channel for the water pipe, to build the school (and already the foundations for its expansion! ), the secure playground, the experimental chicken farm (probably the first of many), latrines and soon the water storage and irrigation projects. The women (and baby!) 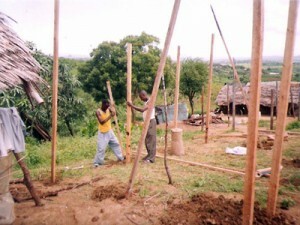 prepare the ground for the water ditch (left) and some of the men help build the new school (right). Please also see Water at Last! 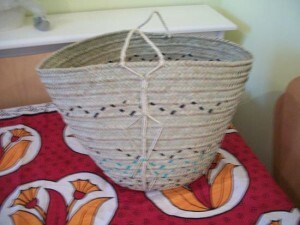 It’s not just the hard work but their talents which are impressive including the wonderful and colourful textiles, woodwork, pottery, and basket work (see some examples below) That is why we are encouraging a community workshop to help develop and promote their skills and perhaps help to fund other village projects. The range of skills is varied and invariably the end results, currently almost entirely for their own use, are excellent. Should any supporter wish to express an interest please let us know. This is an example of a decorative traditional dress (see also the photos of the celebration when the water supply reached the village!) 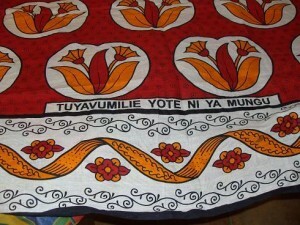 They are used by Marian and Alex as wall-hangings or table cloths! 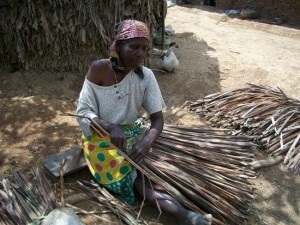 Above is some typical basketry and one of the best basket makers! 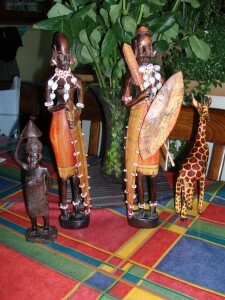 These are some examples of woodcraft. Let’s hope we can help the villagers to support themselves by further promoting their crafts and giving pleasure to more people.